It’s a common misconception, but this statement is not always true. 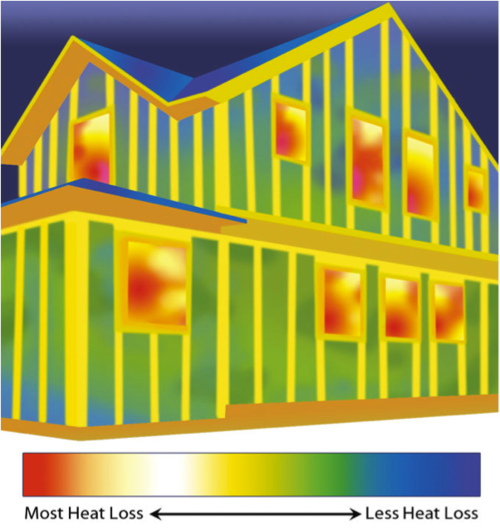 R-value measures a materials’ resistance to heat transfer so R-value certainly affects how well the home is insulated but it is definitely not the only factor. A high R-value is great, but that number is based on a controlled environment free from wind and air pressure changes. The number loses meaning during air pressure changes, with the wind pushing air through the house. Fiberglass batt insulation has a high R-value in a 2×6 wall (R-19), but has a lot of air gaps that allow exterior air to filter into the house. Foam insulation (R-6 per inch thickness) is a superior product at eliminating air transfer, but is also the most costly form of insulation. So a 2×6 wall of fiberglass batt insulation (R-19) in reality does not perform nearly as well as a 2×4 wall of open cell spray foam (R-18) or blown fiberglass (R-16). In Urban North, we are going to present a balanced approach with installing blown-fiberglass insulation into the walls, with a solid barrier of 1” rigid foam around the exterior walls of the house. This 1” rigid foam carries R-5 rating, and will provide the air barrier to boost the efficiency of the R-21 rating the wall will have. The ceilings and roof lines will also have a balance of insulation materials to continue the higher efficiency of the building envelope. Ready to move to Urban North? There’s only 5 4 lots left!